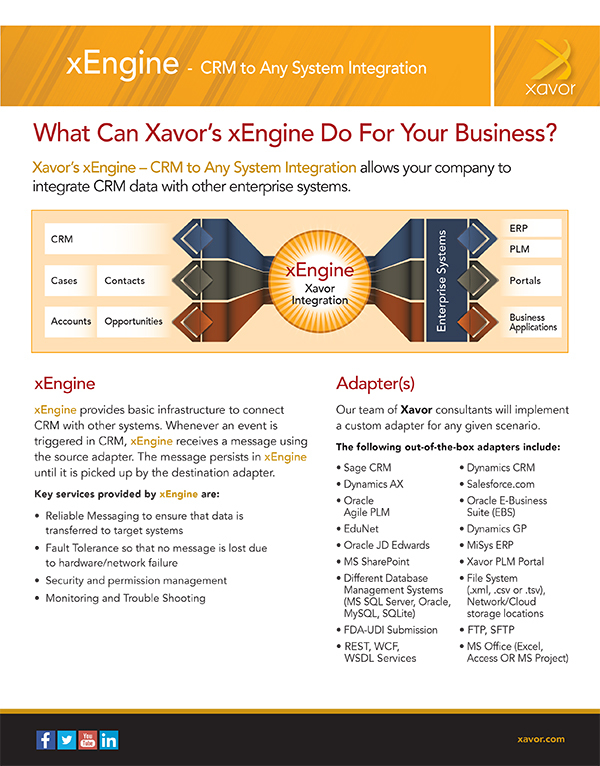 Xavor’s xEngine – CRM to Any System Integration allows your company to integrate CRM data with other enterprise systems. Xavor’s xEngine – Salesforce.com to Any System Integration allows your company to integrate Salesforce.com data with other enterprise systems. xEngine provides basic infrastructure to connect CRM with other systems. Whenever an event is triggered in CRM, xEngine receives a message using the source adapter. The message persists in xEngine until it is picked up by the destination adapter. Our team of Xavor consultants will implement a custom adapter for any given scenario. When a Quality Case is created in CRM, xEngine immediately pushes the case details into the other system. In addition, you can keep all cases synced at all times if it changes on either side. When integrating an opportunity with ERP, as soon as an Opportunity is won, a corresponding sales order is created within the ERP system. As soon as an Account or Product is created in CRM, the ERP system (or other system) reflects quantity on-hand changes. The corresponding item in CRM is also updated for reference and visibility for the sales team.